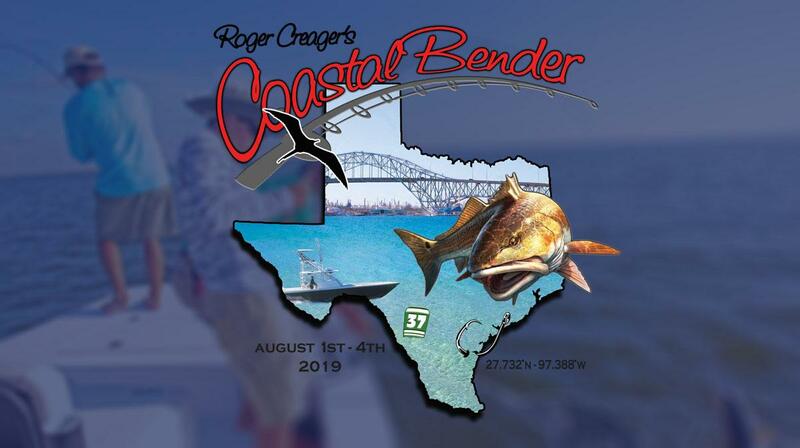 Welcome to the 2019 Roger Creager's Coastal Bender. Thank you for your interest in our event and Fishing Tournament! The Coastal Bender Fishing Tournament is a homegrown event courtesy of the Gulf Coast Tournament Association. Our goal is to bring an event to OUR HOME city, that has something for everyone to enjoy! Whether you want to fish from the Beach, a Boat, or a Kayak, we have you covered. VIP Experience throughout the entire weekend. You will have full access to the Outdoors Expo, Concerts, and festival. Anglers will have a private, sectioned off area during the concerts with a private bar. You will be able to interact with the performing artists on a personal level, as they will be playing a large role in the weekend festivities. You will be invited to a private participant dinner on Thursday for the Captains Dinner; Friday and Saturday evenings dinner plus a recovery brunch. 1) Applicable Laws: Federal, State and Local laws shall be obeyed by contestants at all times. Contestants choosing to fish outside of Texas waters shall adhere to the local and state laws of the venue in which the contestant is fishing, including purchasing and possessing a valid fishing license for that state effective for the dates of competition. Violation of any federal, state and/or local laws shall result in the disqualification of the individual and his team from the Coastal Bender Fishing Tournament event, and may disqualify (at the discretion of the event’ officials) the individual and his team from the entire series. 2) Tournament Eligibility: Contestants under 18 years old must fish with their legal guardian, or another adult approved by the minor’s legal guardian. The tournament officials reserve the right to refuse membership and participation in any event to any individual and/or team at the discretion of the tournament committee. 4) Sportsmanship: Coastal Bender tournament participants are expected to follow the highest standards of sportsmanship, courtesy and ethics. Unsportsmanlike and unethical conduct will result in disqualification (at the tournament committee’s discretion). Please refer to the Federal & Texas Boating Safety Rules. 5) Permitted Tournament Fishing Waters: Bay Fishing Contestants may fish in any inshore public water accessible by boat, or car “Inshore” for this series is defined as the navigable, tide consumable coastal waters, bays, rivers, and wetlands, extending to the inside of the passes to The Gulf of Mexico. Contestants may not fish beyond the furthest point of a pass extending into the Gulf of Mexico. Contestants fishing the bay side may fish from boat, by car are walk in and Kayaks may fish inland bay shorelines or inland bay piers. Bay fishing Division anglers are not allowed to fish on any beach front or shoreline that is touching the Gulf of Mexico. 6) Permitted Fishing Methods: All tournament fish shall be taken by rod, and reel. Prior to and during the tournament, contestants shall not “cork” or otherwise mark fish or schools of fish for identification for the purposes of locating fish during tournament hours. Wade-fishing is allowed. A wade-fisherman must net his own fish. 7) Tackle and Equipment: Any bait can be used by a tournament angler. Only one rod and reel may be used at any one time per angler. 8) Bay Division Fish: All fish will follow Texas and Federal Laws on each species. Each tournament angler is allowed to bring 1 of each species listed below up to scales. After tournament angler brings fish to scales anglers will not be allowed to return to vehicle to retrieve other fish. Listed below are categories for weight and documentation. Flounder: 14in. minimum length. 100 pts. Gaff Top: 14in. minimum length. 100 pts. 8) Permitted Tournament Fishing Waters: Contestants may fish in any inshore public water accessible by boat. "Inshore" for this series is defined as the navigable, tide consumable coastal waters, bays, rivers, and wetlands. Kayaks must be launched at a public launch accessible to the general public. You may not launch from private property (including your personal water front property), or any other place that requires "special permission". This is an inshore tournament only, you may not fish the surf, jetty's or any beach front. Contestants may not fish areas designated as private or “off limits" by federal, state and/or local law. Off limit areas include all FEDERALLY PROTECTED AREAS. If you drag, float, or are around a weir, dam or barrier to gain access to an off limit area, you will be disqualified. You may drag over public land in a marsh lake area to access the same public areas. 9) Permitted Fishing Methods: All tournament fish shall be taken by rod, reel, and artificial tackle, only. Contestants shall not “harass" Fish prior to and during the tournament, contestants shall not "cork" or otherwise mark fish or schools of fish for identification for the purposes of locating fish during tournament hours. Wade-fishing is allowed as long as angler stays tethered to Kayak. 10) Checkpoints: Official DROP A LINE times will be announced at the captains meeting and on Facebook on the Coastal Bender page the night before event (safe light anglers) . Official time will be made at captains meeting which is mandatory for 1 team member. It is the contestant’s responsibility to know his, official tournament time and check-in time. Once an angler has checked in, that angler will not be allowed to return to fish during the day’s competition and that anglers day of fishing shall cease. Check-in times will be between 3:00 PM and 6:00 PM. Contestants who are not at the official checkpoint area at the appointed time will be penalized at the rate of one-half (1/2) pound, per minute, which will be deducted from the team’s total day’s weight. Any contestant more than fifteen (15) minutes late will be disqualified from that day’s weight entry. Teams who are not able to check in due to equipment failure or other unforeseen circumstances are responsible for contacting the tournament director before the official check-in is over in order to determine an acceptable solution. 11) TACKLE AND EQUIPMENT: Any bait can be used by a tournament angler. Only one rod and reel may be used at any one time per angler. kayak, canoe, hybrid kayak, paddle or peddle craft only…no motors. All kayaks must be physically launched. You may not ferry your kayak (the use of a motorized vehicle or boat to transport your kayak on water or land once launched.) You are allowed to do a one way. This is parking a vehicle at your starting point and working your way to your other vehicle at your takeout spot. You are not allowed to do a one way unless you are fishing with another registered angler in the Coastal Bender Event. 12) Fish: All fish will follow Texas and Federal Laws on each species. Each tournament angler is allowed to bring 1 of each species listed below up to scales. After tournament angler brings fish to scales anglers will not be allowed to return to vehicle to retrieve other fish. Listed below are categories for weight and documentation. 13) Permitted Tournament Fishing Waters: All anglers and boats participating in the Coastal Benders Offshore division must observe and obey all State and Federal fishing regulations also no angler is allowed to enter the water unless it is only for emergency repairs to bottom of hull or transom. Gulf of Mexico is your permitted fishing waters for this Coastal Bender event. 14) Permitted Fishing Methods: All tournament fish shall be taken by manual rod, and reel. Prior to and during the tournament, contestants shall not “cork” or otherwise mark fish or schools of fish for identification for the purposes of locating fish during tournament hours. During Coastal Benders event any bait can be used live or dead as long as it follows State & Federal Law guidelines. Anglers will be allowed to catch bait while waiting for their designated time to break the jetty system they are leaving from. 16) Tackle and Equipment: Any bait can be used by a tournament angler. All rods and reel used by contestants in the Offshore division of the Coastal Bender event must be manual, nothing electric. 17) Offshore Division Fish: All fish will follow Texas and Federal Laws on each species. Each tournament angler is allowed to bring 1 of each species listed below up to scales. After tournament angler brings fish to scales anglers will not be allowed to return to vehicle to retrieve other fish. Listed below are categories for weight and documentation. 18) General information: All contestants must have a Texas fishing license and appropriate federal permits, if needed. Weigh station will open at 3:00 pm till 6:00pm each day. All fish must be in edible condition. A Coastal Bender Official must weigh and measure all tournament fish entries. Gaff hook marks are not considered mutilation. Firearms, Bang sticks, Spear Guns, or Harpoons may not be used on any fish. Contestants may fish aboard any vessel as long as all tournament rules are followed. This includes private boats, charter boats, and party (head) boats. NOTE: Fish which have a minimum or maximum size limit will be disqualified if, in the judge’s opinion, the head or tail has been altered or damaged and cannot be measured or weighed accurately. All fish must be caught on a single rod and reel using bait and hooks or lures and hooks. Coastal Benders encourages all contestants to practice catch and release with fish that are not in contention for a trophy.Coastal bender Officials decisions will be final in all cases and all contestants are subject to a polygraph test if deemed necessary by Coastal Bender Officials. 19) Permitted Tournament Fishing Waters: Kayaks must be launched at a public launch accessible to the general public. You may not launch from private property (including your personal water front property), or any other place that requires "special permission. Contestants may not fish areas designated as private or “off limits" by federal, state and/or local law. No ferrying kayaks to spots with other vessels. PFD’s must be worn at all times during tournament hours. Participants are not allowed to fish within 150 feet (50 yards) of another anchored boat unless they are invited in by the angler. An anchored boat is a boat held in a stable position by an anchor, a weight, push pole, PowerPole, or other "anchoring" mechanism. If angler invites another team into the inviting team’s 50 yard area, any tournament participant is also allowed within the waived area. Range finder and picture of boat behind range finder best way to bring this sort of protest to light. The boat anchored in an area first has the right to 150 feet radius of the area. 20) Permitted Fishing Methods: All tournament fish shall be taken by rod, reel, and any bait that is legal and follows Texas and Federal Laws. Contestants shall not "cork" or otherwise mark fish or schools of fish prior to or during the event for identification, for the purposes of locating fish during tournament hours. Kayaks shall not have motors of any kind. No electric reels. No diving from your kayak to spear a fish, this is a fishing tournament, not a spearfishing tournament. Boats can not chum for kayakers but kayakers may chum for themselves out of the kayak. 21) Checkpoints: Official DROP A LINE times will be announced at the captains meeting and on Facebook on the Coastal Bender page the night before event (safe light anglers). Official time will be made at captains meeting which is mandatory for 1 team member. It is the contestant’s responsibility to know his official tournament time and check-in time. Once an angler has checked in, that angler will not be allowed to return to fish during the day’s competition, and that anglers day of fishing shall cease. Check- in times will be between 3:00 PM and 6:00 PM. Contestants who are not at the official checkpoint area at the appointed time will be penalized at the rate of one-half (1/2) pound, per minute, which will be deducted from the team’s total day’s weight. Any contestant more than fifteen (15) minutes late will be disqualified from that day’s weight entry. Teams who are not able to check in due to equipment failure or other unforeseen circumstances are responsible for contacting the tournament director before the official check-in is over in order to determine an acceptable solution. 22) Boat Regulations: Each vessel must have all required U.S. Coast Guard safety equipment. Plus any safety equipment the state requires for kayakers. No motors will be allowed everything is to be self propelled. The use of a motorized vessel is prohibited to ferry kayaks to fishing grounds. All kayakers must be self propelled. 24) TACKLE AND EQUIPMENT: Any legal bait can be used by a tournament angler. Only one rod and reel may be used at any one time per angler. Kayak, canoe, hybrid kayak, paddle or peddle craft only…no motors. All kayaks must be physically launched. You may not ferry your kayak (the use of a motorized vehicle or boat to transport your kayak on water or land once launched. You are not allowed to do a one way unless you are fishing with another registered angler in the Coastal Bender Event, then you are allowed to do a one way. This is parking a vehicle at your starting point and working your way to your other vehicle at your takeout spot. You are not allowed to do a one way unless you are fishing with another registered angler in the Coastal Bender Event. 25) Fish: All fish will follow Texas and Federal Laws on each species. Each tournament angler is allowed to bring 1 of each species listed below up to scales. After tournament angler brings fish to scales anglers will not be allowed to return to vehicle to retrieve other fish. Listed below are categories for weight and documentation. 26) Tackle and Equipment: Any legal bait can be used by a tournament angler. All tournament fish must be caught by human powered rod and reel. No gigging, seine nets, spearing, cast nets, gill nets, or gaffs may be used to capture tournament fish or to aid in landing tournament fish. A rope can be used to aid in the landing of a catch, only when looped around the tail of the catch. A landing net may be used to land a non-shark catch. 27) Beach/Surf Division Fish: All fish will follow Texas and Federal Laws on each species. Each tournament angler is allowed to bring 1 of each species listed below (EXCEPT SHARKS, NO SHARKS BROUGHT TO SCALES) up to scales. After tournament angler brings fish to scales, anglers will not be allowed to return to vehicle to retrieve other fish. Listed below are categories for weight and documentation. Sharks will be a video/picture release with the item of the day in your video. Shark release information and rules will be below. 28) Checkpoints and Inspection: Each tournament will have designated checkpoints.. The checkout point and times will be communicated to the angler at the pre-tournament (“captain’s”) meeting. It is the tournament anglers responsibility to know his, official tournament time and check-in time. Failure to go through the checkpoint will result in disqualification. Once a tournament angler has checked in, that angler will not be allowed to return to fish during the day’s competition and that team’s day of fishing shall cease. Check-in times will be between 3:00 PM and 6:00 PM. Contestants who are not at the official checkpoint area at the appointed time will be penalized at the rate of one- half (1/2) pound, per minute, which will be deducted from the team’s total day’s weight. Any contestant more than fifteen (15) minutes late will be disqualified from that day’s weight entry. Teams who are not able to check in due to equipment failure or other unforeseen circumstances are responsible for contacting the tournament director before the official check-in is over in order to determine an acceptable solution. 29) Polygraphs: By signature on the official tournament entry form, each contestant agrees to submit to a polygraph test and be bound by its interpreted results and conclusions. Polygraph tests may be issued at the discretion of the tournament director/ committee for any reason, and each contestant hereby acknowledges and consents to the examination. The results and interpretations of the polygraph are final and each contestant hereby knowingly, intelligently and voluntarily waives any review of said test result, including any judicial process seeking to overturn, amend or otherwise negate the finding of the test administrator. 30) Insurance and Liability: The Coastal Benders event will not issue liability coverage for its events. A current copy of the anglers signed DECLARATION, WAIVER, RELEASE, AND HOLD HARMLESS AGREEMENT shall be given to Coastal Bender tournament staff before a team may compete in any Coastal Benders event. All tournament participants are required to sign a waiver absolving all tournament officials, officers, participants, sponsors and co-sponsors from any responsibility for damage or personal injury sustained as a result of the contestant’s participation in the tournament or its related activities, and the contestant’s signature on this form shall constitute in an alternate release in the instance the member fails to sign the official DECLARATION, WAIVER, RELEASE, AND HOLD HARMLESS AGREEMENT. 31) Pre-Tournament “Captain’s” Meeting: Late Tournament Registration for the Coastal Bender 1st Annual fishing tournament will be the Thursday evening before the tournament date between 5:00 PM and 6:30 PM. A pre-tournament meeting will be held following registration at 8:00 PM. Captains Dinner is mandatory. Participants may be excused from the Thursday night meeting if arrangements are made with the GCTA or Coastal Bender Tournament office. 33) Entry Fees, Tournament Registration and Identification: The entry fee for the event is $199.00 per angler, before June 1st, 2019 this is early bird sign up. Entry after June 1st 2019 will be $250.00 per angler. Late entry will start July 16th 2019 up until the night of Captains meeting. Late entry fees will be a total of $300.00 All entry fees are non-refundable. 34) Boaters: All boat anglers participating in 1st Annual Coastal Benders Fishing Tournament must have all required U.S. Coast Guard safety equipment. The kill switch device must be attached to the driver's body anytime the combustion engine is operating on any boat. Anytime the combustion engine is operating and in gear, there must be a driver in the driver's seat in full control of the boat. Any additional fuel used during the tournament day must be purchased from a retail facility open to the public. 35) Safety: Safe boating will be observed at all times. Each contestant is required to have a U.S. Coast Guard approved, personal floatation device. Tournament days may be shortened or canceled due to unsafe weather or water conditions. The decision to shorten or to cancel will be left totally to the discretion of the tournament director/ committee. A 4-hour period shall constitute a day of fishing. It is the competitor’s responsibility to communicate with the Tournament Director if cancellation of the event is suspected. Cancellations will be communicated via VHF radios on a channel decided at the Pre-Tournament Meeting. If conditions are not safe on the tournament day, the GCTA reserves the right to reschedule the tournament on the following day (Sunday). If conditions are not favorable the following day (Sunday), an alternate date will be published on the GCTA website plus all platforms of social media. 36) Scoring & Awards: Tournament standings, auxiliary awards and final winners shall be determined by the total weight of each tournament anglers catch during the tournament, measured in pounds and 100 th of a pound. Fish may not be brought to weigh-in on a stringer or in a basket. Fish shall be weighed with the equipment provided by the GCTA staff member. Each species of fish will have awards for 1st, 2nd & 3rd place trophy with a big fish pot plaque for each species category. Grand Champion Awards will consist of total points of all fish brought to scales from each anglers weigh in totals. Accumulated fish points will be added together to make each anglers Grand Champion total points we will Award Grand Champion, Champion, 1st Runner -up, and 2nd Runner up. Every angler will have a Grand Champion Points if an angler has just 1 species or all 5 species. 37) Ties: If two or more anglers have identical weight in the tournament, it will be considered a tie. In the event of a tie, the prize/pot money from the consecutive places will be combined and split between the teams. For example, if two anglers tie for fourth place, the amounts designated to fourth place AND fifth place will be combined, divided by two, then distributed to the anglers equally. In Grand Champion points race for the overall grand Champion a tie will be decided by first team that weighs in on day 2 in case there is a tie in points for Title of Grand Champion, Champion, Runner Up & 2nd Runner up awards. 38) Protest Procedure: All protests must be submitted in writing, along with a $100 cash deposit. Protests must be submitted to the tournament director no later than 15 minutes following the weigh-in of the last fish. All decisions will be made by the tournament director and committee, and are final. If the protest is upheld, the cash deposit will be returned to the person submitting the protest. The protester agrees that by filing a protest, he may be subject to a polygraph test. 39) Permission to be filmed and photographed & additional waiver : All participants agree to be filmed, photographed, taped, interviewed, quoted or otherwise revealed, without compensation, by the GCTA, Coastal Benders staff or its assigns. This includes but is not limited to the official photographers, writers, hosts, or sponsors of this event under the conditions authorized by the Coastal Bender Tournament organizers. Each contestant, by his signature affixed below, hereby gives the GCTA, and its assigns, the right to use (without compensation) the contestant’s name, picture, likeness, quotes, and biographical information, whether audio or visual, before, during and after the period of an individual or team participation in an event. *The captains meeting is mandatory unless other arrangements and approval are granted by GCTA and/or the Tournament Committee. Entry Fee into tournament per angler includes: V.I.P Access to all Dinners, Concert, plus Event access while Coastal Benders Event is happening. 5pm - On-Site Registration is open.